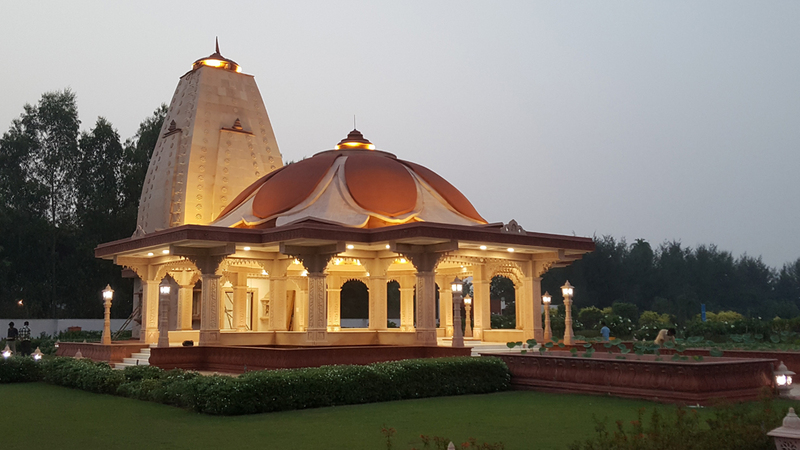 Shivji temple is designed for Reliance Utility Engineering Limited in their 4x300 MW Rosa Thermal Power Project at Rosa, Shahjehanpur, Uttar Pradesh. This Project has hundreds' acres land in their use. Hundreds' of staff members are going to stay there in project land. Reliance management has considered the requirement of religious structure for their families. 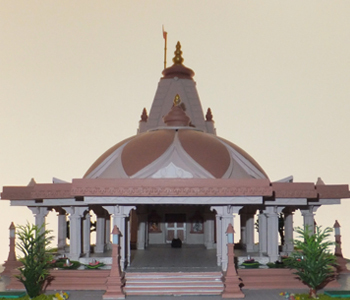 A beautiful Lord Shiva temple is designed by Temple Architect Subhash Bhoite, M. Director of company; Temple Architects India Pvt Ltd for them. 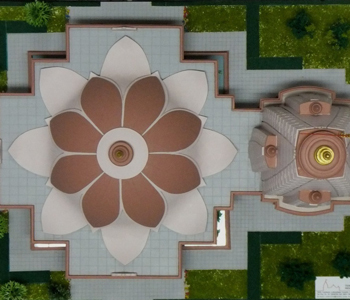 Grand Lotus shaped Shiva Temple with 18' x 18' Garbha Griha and 50' x 50' Sabha Mandap with Entrance Porches from three sides. 4Nos. big Lotus Ponds around Sabha Mandap adding cooling effect to body and mind. Blossoming lotus flowers will definitely create smoothing effect to eyes and hearts also. Half round dome is designed above Sabha Mandap which is covered with inverted lotus flower. 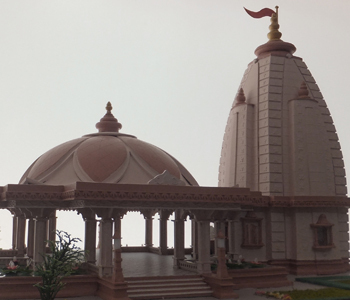 superbly designed landscape will enhance the loveliness of temple. Main Deity of the temple is Lord Shiva. 3 feet high Narmadeshwar Shivlinga with 3 feet long black coloured stone Jaldhari will be placed at centre of Garbha Griha. Relief work of Shivji Pariwar with statues of Shree Ganeshji, Shree Shivji, Mata Parvati and Shri Kartikeya will be carved over Marble slab and fixed behind in rear side wall. Big size hanging Dhara Patra will be pouring water over the Shivlinga continuously. 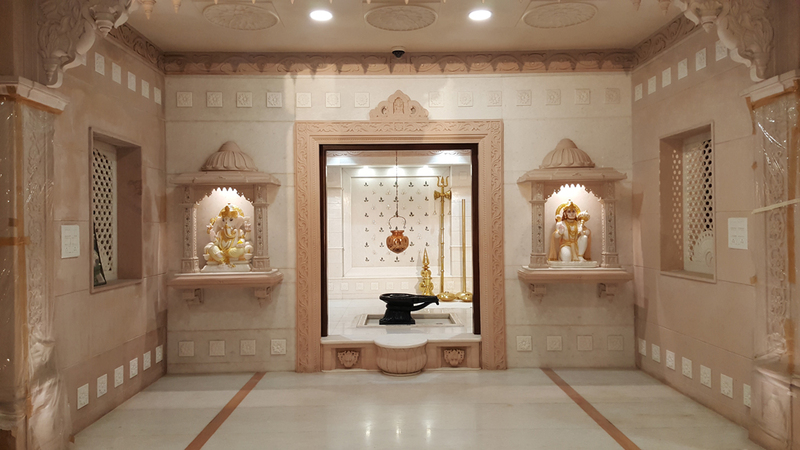 Auspiciously Designed False ceiling and beautifully designed marble flooring with semiprecious stones will add religious feel in the Garbha Griha. Mrs. Tina Ambani is taking keen interest in this temple project. Management has appointed Mrs. Dina Amin as co-coordinator for this work. All of company's staff members also heartily cooperating in this temple project. 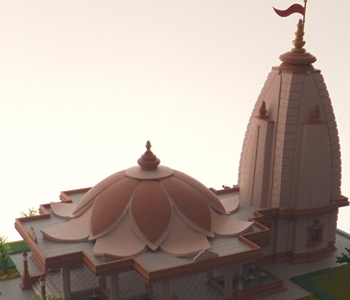 Temple is under construction and will be constructed within period of 18 months. (pron. : meaning "auspicious one"; is a Hindu deity. He is considered the Supreme God within Shaivism, one of the three most influential denominations in Hinduism. In other branches of Hinduism such as in the Smarta tradition, he is regarded as one of the five primary forms of God. He is "the Destroyer" or "the Transformer" among the Trimurti, the Hindu Trinity of the primary aspects of the divine. Shiva is usually worshipped in the anionic form of lingam. He is described as an omniscient yogi, who lives an ascetic life on Mount Kailash, as well as a householder with a wife Parvati and two sons, Ganesha and Kartikeya and a daughter Ashoka Sundari. Shiva has many benevolent as well as fearsome forms. He is often depicted as immersed in deep meditation, with his wife and children or as the Cosmic Dancer. In fierce aspects, he is often depicted slaying demons. In many holy texts and puranas like Mahavishnu, Shiva or Mahadeva is also called Paramatman (Supreme soul). Shaivas often see him as Parabrahma (Supreme Brahman), and is regarded as Bhagwaan by devotees. The Shiva Sahasranama (1000 names of Lord Mahadeva) declares Shiva as "Paramatman", the super soul found everywhere. He is commonly connected to the practice of Yoga. Front entrance wall of Garbha Griha will be preciously designed with 2 Nos. of Zarokas housing 1 st quality white marble statues of 1) Ganesha and 2) Hanumanji. Hanuman (also known as Anjaneya and Maruti) is a Hindu Deity and an ardent devotee of Lord Rama, a central character in the Sanskrit epic Ramayana. Folk tales increasingly eulogize the powers of Hanuman and he is considered an avatar or reincarnation of Shiva. The qualities of Hanuman, his strength, courage, wisdom, celibacy, devotion to Rama and the many names by which he was known is detailed in Hanuman Chalisa. There are more temples devoted to Hanuman than any other deity in India and recitation of Hanuman Chalisa is one of the common religious practices. Hanuman Chalisa (Hindi: "Forty chaupais on Hanuman") is a devotional song based on Lord Hanuman as the model devotee. It is a poem written by Tulsidas in the Awadhi language, and is his best known Hindu text apart from the Ramcharitmanas. The word "chalisa" is derived from "chalis" in Hindi, which means 40, as the Hanuman Chalisa has 40 verses.